Nowadays, there are still bandoneón makers working on this kind of instrument. But many people still want to find an old instrument which is usually known as the "pre-war bandoneón"(those bandoneón produced between WWI and WWII) . Most of professional tango musicians believe that only those instruments have the bandoneón tone for Argentine tango. Although the contemporary made bandoneón have the same system and functions, how every, reeds are different. Even the most famous Double A(Alfred Arnold) bandoneón made after 1945 are mediocre. The attempts of re-start building bandoneón is still on going. After decades, the famous Double A was brought back to assembly line in Klingenthal, Germany. And there is still endless debate to convince people that newly built bandoneón are as good as those old pre-war bandoneón, while most of bandoneón lovers still go for the old ones.But, at least, it is good to have new bandoneón makers. Otherwise, the history of bandoneón will end, as well as the so-called "Argentine Tango". Those new instruments manufactured by Uwe Hartenhauer , according to its users, are the ones closest to famous AA pre-war bandoneón. Wu Yung-Lung from Taiwan, ROC playing Adios Nonino with UH bandoneon-Reinische 142 system. The advantages of choosing new bandoneón as your instrument are those following: 1. They are new. Compare to those pre-war ones, they are in a stable condition. That means you do not need to spend extra money to repair your instrument or get it tuned;2. The new bandoneón can be manufactured as you want. It is not only about the decoration ,but even creating your own system. 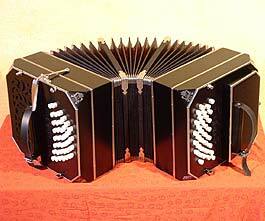 Hybrid bandoneón are made for those accordionist who plays B-system or C system button accordion. But if you wants to have an old bandoneón, that is even a better choice. An old bandoneón, especially the pre-war made bandoneón, is not only musical instruments, but also antique for collectors,although it can not afford to be. If you do not get it right now, who knows what gonna happen later on? In the year 2009, the congress of Argentina had established the Bandoneón Law to ban export of any bandoneón older than 40 years. Frankly says, there is still possibility to bring one out from Argentina, but it is immoral. In addition, this law has created a mad rush on instruments and inflated the price. Montevideo, the capital city of Uruguay, is another choice beside Buenos Aires for those who wants to buy an old bandoneón. Always remember, besides these two place, it is hard to find pre-war bandoneón . And it is almost impossible to find a tuner near you if you do not live in these two cities.Meanwhile, most of the Pre-war bandoneóns are in their age of 70's or more, and need repair to bring them back to ready to play condition.